WASHINGTON (AP) — One after another, angry Democrats took to the House floor to say Republicans would increase hunger in America by stripping food stamps from the farm bill. In reality, though, the bill passed by the House on Thursday didn't deal with food stamps at all. And the lack of congressional action on food stamps could keep the $80 billion-a-year program untouched by any cuts. That didn't stop several Democrats from stating that the legislation "takes food nutrition from working families." House Minority Leader Nancy Pelosi told Republicans just before the bill passed on a narrow 216-208 vote: "You are taking food out of the mouths of your own poor constituents." 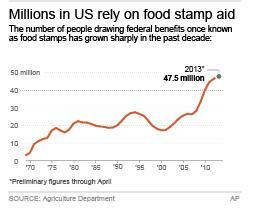 Money for food stamps, now called the Supplemental Nutrition Assistance Program, or SNAP, has for decades been linked to farm programs in what is known as the farm bill. That union has brought urban Democratic support for the rural farm programs, which are renewed about every five years. But the longtime pairing ended abruptly amid battles over cuts in the food stamp program, which derailed the farm bill last month. Some Republicans have said there is rampant fraud in the program and benefits are going to some people who aren't eligible. In the 2012 presidential campaign, then-candidate Newt Gingrich once said that people could use food stamps for anything, including trips to Hawaii. In fact, food stamps can only be used for food purchases at retail outlets. And Agriculture Department officials have cracked down on fraud in recent years. The program has still doubled in cost since 2008, to almost $80 billion a year. Although some benefits have gone up, the main growth comes from a big jump in the number of participants, a result of the economic recession. All told, almost 47 million people used SNAP last year, or one in seven Americans. That number has not gone down this year. 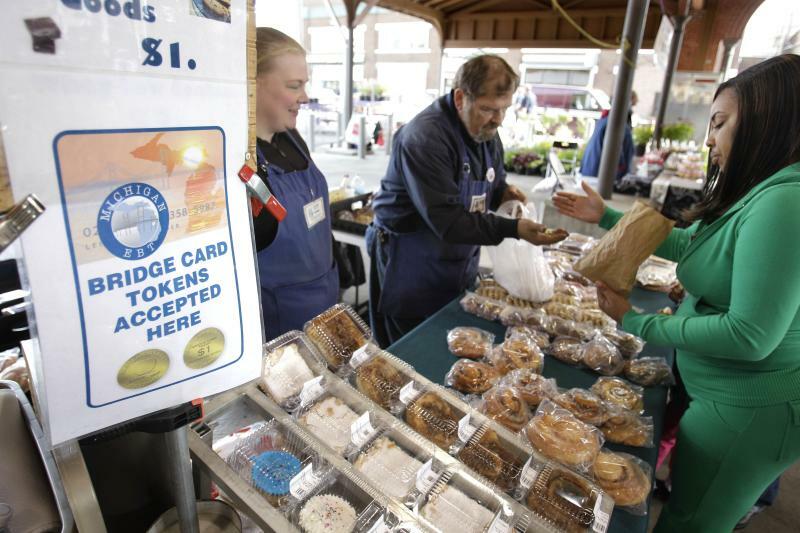 Republicans said a separate food stamp bill would come at a later date. Until that happens, food stamps will continue as they are. They are paid for by annual spending bills and the Democratic Senate and President Barack Obama have strongly objected to making major cuts. Still, the concerns that Democrats expressed Thursday could come to fruition. House Republicans have made many different proposals that would radically overhaul food stamps — cracking down on eligibility, increasing work requirements or adding an expiration date to the program. And after quickly moving the farm-only bill to the floor and rallying most of his caucus to vote for it, House Majority Leader Eric Cantor, R-Va., said Republicans would "act with dispatch" to get a separate food stamp bill to the floor. But it won't be easy. Republicans themselves are divided on the issue. There is no consensus on how much the program should be cut or changed, and more moderate Republicans would likely balk at the bigger changes sought by conservatives. Adding to the difficulty is how those issues would be resolved in conference negotiations with the Senate, which passed its own version of a farm bill in June. That bill includes food stamps and would only cut them by a half percent. Senate Democrats have said repeatedly that they will reject major changes or higher cuts to the program. All of that disagreement strongly strengthens the possibility that current food and farm law will simply be extended when it expires in September — keeping food stamps at the same levels they are now. The greater concern for food stamp advocates is the long-term damage that splitting the farm bill in two, and making food stamps a partisan issue, could have. If SNAP is not protected in the farm bill, or if future farm bills don't pass, Republicans could eventually find other ways to cut SNAP — including in the annual appropriations bills that actually fund the food stamps. "There's a long history of bipartisanship on this," Rep. James McGovern, D-Mass., said on the floor, referring to food stamps in the farm bill. "All of a sudden this has become a partisan issue, and the target, so that you can try to balance the budget, has been placed right on the programs like SNAP."